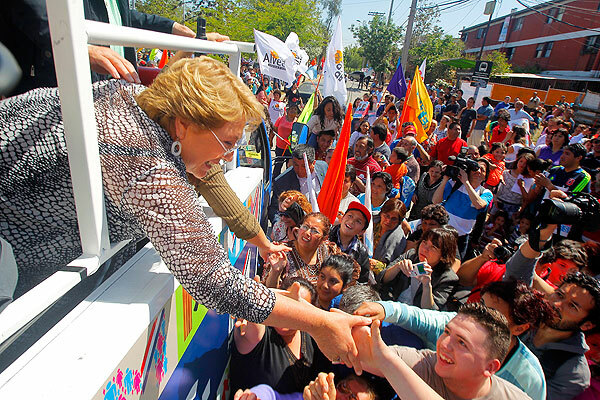 It wasn’t supposed to be this way for Michelle Bachelet. After returning from a supposedly glorious stint at the UN, after numerous polls gave her a commanding, overwhelming lead, this election was supposed to be a cake-walk. Her victory – dare I use the pun? – was supposed to be a tsunami. Fully confident of her win, she assumed the role of vessel for a yearning for change that some Chileans seem to be loudly expressing. She put together a coalition of centrist Christian Democrats longing to return to power, and radical Communists who effectively vetoed, for example, any criticism of the Bolivarian Revolution, all glued together by that cryptic smile of hers, by a candidate that waved and avoided saying much, under the umbrella of a slogan (“Chile de todos“) that was as unassailable as it was false. By the sheer virtue of her stature and her charisma, she was supposed to glide to a first-round victory and a large super-majority in Congress, one that would give her a mandate for sweeping change. “Un congreso para Michelle ” read numerous advertisements. Instead, Michelle Bachelet finds herself in an annoying second-round battle with Evelyn Matthei. Sure, she’s going to win. Come March, she will be President, one with comfortable majorities in Congress. But it won’t feel as sweet. Bachelet set incredibly high standards for herself, and she failed to achieve them. She now has a choice. She could interpret this solid, yet underwhelming win as a mandate for radical change. She could convince herself that an abstention rate of 45% – unheard of in Chile – is not important, that the second round is not important, and that institutions are not important, and simply claim a mandate. In other words, she could be CAP. Remember that in 1988, CAP misinterpreted what the voters wanted. He trusted that by the sheer will of his persona, he could push through radical changes, changes that Venezuelans were simply not ready to accept, and that they hadn’t really voted for. Hubris engendered follies, and we are still suffering from it. Bachelet could do that. She could claim a mandate to change the Constitution, to upend Chile’s tax structure, to do away with the “perverse” neoliberal system that served her, as well as her coalition, so well during their 20 years in power. She could convince herself that, doggone it, Chileans like her, they really like her, so she’s going to do what she feels is right, and damn the torpedoes. Higher taxes! Gay marriage! Abortion! State-owned enterprises! Do away with the pension funds, private health insurers, and private education! Out goes the Constitution! Off with all of their heads! Like CAP, however, she would be wrong. Chileans don’t really want radical change, and this election showed it. When push came to shove, this conservative society decided that, yes, some change would do us nicely, but don’t get carried away Michelle. You can’t claim a revolution if roughly half of the people don’t even bother to vote. Chile has its problems. Inequality is persistent, education needs to improve, and Chile needs to find creative ways of diversifying its economy. But Chileans do not want to go hard left, and Bachelet would be a fool to think otherwise. A country that is growing solidly, with full employment, with a broad middle class … doesn’t commit suicide. This is not Bolivia, nor Venezuela, nor Argentina. Chile’s near future depends on how she decides to read her mandate.